1. The justice system in the eighteenth century seems outrageously unjust. No defense attorneys, judges who make a living through bribes, and shopkeepers who sell evidence. What do you think will shock readers three hundred years from now about our justice system? 2. Benjamin Weaver seems to be a mix of brutality and compassion, the practical and the idealistic. What do you think of his sense of justice? Do you agree with the decisions he makes of whom to punish and whom to let go? What do his inconsistencies tell you about his character? 3. Eighteenth-century parliamentary elections had expensive campaigns, bribes, and thugs. They attracted the power-hungry and the greedy, liars and thieves. Is there something inherent about politics that draws these types of people to it? Is there anything that can be changed about how campaigns are run that would minimize corruption? 4. In one fell swoop, Miriam completely reinvented herself. She converted, married a man from an utterly different background, and is even called by a different first name. Do you think it is possible to be happy with so many drastic life changes? Does turning your back on your heritage have more to do with hating your past than loving your future? Or is this simply the fulfillment of a lifelong wish to live the life you believe you were meant to live and not the one you were born into? Is this ability to reinvent yourself something with which people in earlier times might have been more comfortable? 5. 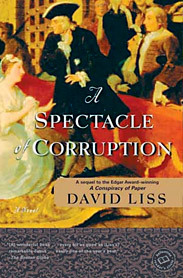 When Weaver dresses as Matthew Evans or as a footman he discovers a whole new world. Is it as easy in today’s world to change your clothes and dabble in a different world? Can you still walk a mile in someone else’s shoes? Are social classes today as obvious or permanent? 6. Weaver keeps expecting to be betrayed by Jonathan Wild, and is constantly surprised when that doesn’t happen. Is Wild as untrustworthy as Weaver thinks he is? Does the novel suggest that there is honor among thieves? 7. There are several incidents of extreme cruelty to animals in the novel. Dogmill, the most brutal villain, clearly relishes goose pulls and cockfights, and was apparently responsible for killing Mendes’s beloved dog. Is there a connection between cruelty to animals and cruelty to humans? Is Mendes humanized by his love for his pets? Or is his conduct toward his fellow man worse when juxtaposed with his ability to display compassion and kindness to animals? 8. Grace Dogmill and Miriam Melbury are very different women, yet they both refuse to settle into the roles that society would like to place them in. Are they equally justified in not wanting to remain where they have been pigeonholed? Who do you think is more sympathetic? Who is stronger? 9. Is Griffin Melbury a good man with a gambling habit and a quick temper or is he a bad man with a deceivingly pleasant personality? Do you think that Weaver is objective enough to tell the difference? Is Miriam? 10. What do you think of the ending? What does Weaver suggest about his role in what happens to Melbury, and why does he depend so much on hint and innuendo?